From my own personal experience, and from Readings that I have done for individuals and groups, I give personal examples and effective guidance for: transcending distracting thoughts; harnessing the power of the will; opening the heart to spiritual love; drawing upon spiritual love to serve other people; discovering the purpose of life; and other important aspects of a spiritual attunement. There is very inspiring mystical knowledge about Jesus that goes far beyond what has been taught by religious organizations in the past. It shows Jesus as a person who achieved enlightenment through a number of lifetimes, and there are details about how that was attained. A picture of the human Jesus is painted that reveals him to be much more than a simple religious icon. I thoroughly explore the pattern of enlightenment that was revealed by Jesus. There is important information about how Jesus embodied the Christ Force to teach human beings the power of love to transform life on earth. Old ideas about “sin” and “Hell” are shown to be related to human fear, with the pattern of enlightenment revealed by Jesus being the way to heal human fear. Many questions are answered about the nature and teachings of the life of Jesus the Christ. I present to the reader a comprehensive method of “spiritual attunement” that can lead to enlightenment. I take the reader through details about my mystical experiences in all of this that I believe will inspire spiritual seekers. I reveal the powerful mystery of what is sometimes called the Christ Consciousness, and which I am calling it the Christ Force. There is knowledge gained through personal spiritual experiences, and through hundreds of readings done on the subject, to show how the extraordinary spiritual energy of the Christ Force is much more than what we have been taught through tradition and religion. I show how the all-loving energy of the Christ Force is available to every spiritual seeker, no matter what their philosophical or religious orientation might be. I just finished your book, Ron, and am blown away...starting to read it again...there's so much there, it is so relevant for my life, and answers so many of my life-long questions....wish the priests had had this wisdom when I asked questions as a child!! I am reading Ron's new book on Jesus and REALLY loving it. As a child, I connected with Jesus and felt his love. Then after going to church, I shied away from Jesus. Recently, I have been so fed up with the religious issues which we kill people with, it makes it hard to connect, but the book is allowing me to open my heart and remember the feelings that I have had for Jesus in my life time. After years of guilt and stifled spiritual explorations, this is a breath of fresh air. Mystery of the Christ Force inspired a quantum leap in my spiritual life. It also opened me to my role and power in the world as well as the influence of others on a daily basis. I am grateful to Ron Scolastico for this important work. I have benefited immensely from it, both in my spiritual life and my worldly life. This book might just rescue Jesus from the fanatical Christians and show the universal nature of his teachings and life purpose! I wanted to share with you since reading the new book. I love, love, love it! It's changed the way I think about Jesus and helped me enormously. I've begun re-reading it already. There's one other thing I'd like to share with you both: I had the very same experience that Ron had when I was a little girl. Two times when I was really sick I felt like I was as big as the entire house, I didn't have any boundaries and it scared the wits out of me. Since I was really sick, when I had the same two experiences, I told myself that it was because I was really sick--high fever and bad cough and sore throat. Then, when I was around 14 or 15 it happened again. This time I wasn't sick. In the garage room that my sister and I slept in there were always roaches crawling on the floor at night, so we NEVER got up until it was daylight. When I had that experience I could hear them walking on the linoleum. Again, I felt like I was bigger than the house and I couldn't feel where the end of my body was. It really scared me again. Actually, it was rather terrifying. It never happened again after that. Also, many times as a young girl I would hear "music of the spheres", or whatever you might call it. The last time I heard it, I was around 29 or 30 years old. Boy, I'd sure like to hear that again. Anyway, it was interesting to read about Ron's experience and totally understand. Just thought I'd share that one with you. I have been meaning to write to you, Ron, to let you know how powerful I found your book on the Christ Force. What this Divine perspective brought to me was an opportunity to fill in the missing piece (peace?) in my relationship with Jesus...and for that gift I am eternally grateful to you and the Guides. I have read and treasured the wisdom of The Mystery of the Christ Force. Thank you for sharing your personal story and more of the Guides' insights. I once had a torrid love affair with Jesus, but lately we'd become estranged. This is bringing it all back. "I could not put this book down. Seekers of higher wisdom will be inspired and delighted!" I enjoyed "The Christ Force" immensely. It is answering a lot of questions I had and helping me with the way forward. Finally the Christ Consciousness makes sense. A book to read and re-read. Thank you so much for your recent book ... it's wonderful! am dearly enjoying your personal journey ~ it's really fascinating! Your quest to understand the God Force mirrors my own quest in some ways and I'm sure many others who were brought up with the 'damnation, fire and hell' teachings of many organized religions. I wanted to let you know that each time I pick up your book, I thank you for sharing your journey! Just a brief note to let you know that I finished reading your new book on the Christ Force this morning. It is so well written and accessible, and so deeply moving. I enjoyed it utterly and I can honestly say that I started feeling its positive effects since I began reading it. Thank you. I am reading the Christ Force book and finding it quite wonderful. Not only is the material amazing (and much, much more beautiful than the organized religion versions), the way the book is put together makes it like talking with a good friend. I even got a whole new perspective on what the Guides call my option for "fulfillment in love" from reading the book. And for the first time in many years, I now look at that option with an opening of the heart. Thank you both for the work and for the book! For more than a decade, I've been a huge admirer of Ron Scolastico's work. This latest book, however, sets a higher standard, if possible. It's so moving when Ron tells his personal story of spiritual evolution. He interweaves this with his signature crystal-pure, high-vibe channeling. Professionals of Ron's stature in the metaphysical community often seem to hold themselves apart, whether writing or teaching or doing readings. 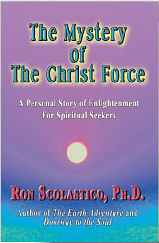 Part autobiography, part channeled wisdom, "The Mystery of The Christ Force" unfolds masterfully to conclude with practical ways to grow spiritually. The book can be a great help in your spiritual journey, with practical wisdom you won't find elsewhere. God is love. Ron's latest book has helped me to experience this deeper and bigger than ever. In conclusion, like every true spiritual teacher, Ron teaches by example—both what he writes and how he writes it. I applaud his skill, managing to accomplish all this as a highly entertaining, fast moving read. I give this book my strongest recommendation. I ordered the Mystery of the Christ force book and devoured it promptly. I have felt a new sense of connection since reading it--a kind of quiet, understated, synthesis of my searchings. Thank you for offering this. It came at a perfect time for me. Before this book, while I had a vague awareness and belief in Jesus, it was almost a Santa Claus like belief. As I read your words about Jesus and his followers, it transformed into something very personal. It felt real and profound. I started having this new and personalized appreciation for who he was, both the human man and the spiritual leader. Ron, I love your story and the way you detail your pursuit of the truth. I find it so interesting and meaningful that I could feel so moved by this. I've given the book to as many people as I can think would be interested, without being pushy. I'm sure I'll be ordering more soon.